Much has been written already concerning the revolution brought about in the twentieth-century by the advent of sound recordings, from the time of Edison’s invention of the cylinder and then that of the phonograph, the first results of which are of Caruso singing some arias into a horn in his hotel room for an exorbitant fee. Essentially, what many artists felt in the dawn of this process was that the recording was a kind of calling-card, an object which, provided you could afford it (and it was expensive, in real terms, compared to what it is now), would encourage music-lovers to come to their concerts. It was, perhaps, not considered a document that would last for generations nor, indeed, a replacement for the live performance. In any case, the old recordings could not be edited and, thus, spontaneity and musicianship took precedence over mistakes and other imperfections. 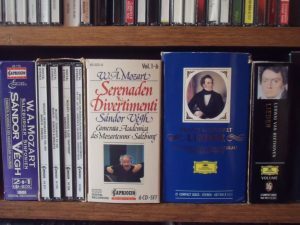 When it comes to recording the familiar repertoire of masterworks, for some time there has been a glut of marvellous recordings which, however, does not, and should not, stop the latest young pianist or conductor from recording those works. But, here comes the crunch: I have observed (or should I say, listened to) many new performances by young artists of standard repertoire and a great proportion of them are unsatisfactory. Why? 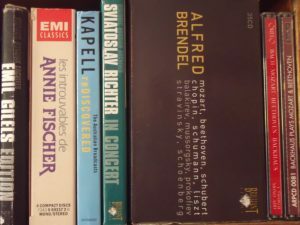 Because they feel compelled to find a novel, exciting and, hopefully, still viable way to play, say, a Beethoven sonata since unless they find a new ‘interesting’ angle, no-one is going to purchase their recording in preference to, say, Brendel, Richter or Perahia. This misfires much of the time: the performance no longer feels natural, genuine, idiomatic or stylistic. Furthermore, many quirks of interpretation or spontaneous touches (however pre-meditated) do not wear well on repeated hearings. It is such a contradiction that, on the one hand, some of the great master pianists, for example, recorded in an extremely imperfect medium and the product was not durable (yes, we can hear re-issues now) – yet we still listen to them because they made recordings of works they had been playing for decades and they played them naturally, without affectation, superficial mannerisms or fear of comparison with others. On the other hand, we now have a product with perfect recording, clean sound, noiseless reproduction, a carrier which, theoretically, could play for hundreds of years – but, due to idiosyncrasies, mannerisms and ‘new’ approaches by younger artists, we are less inclined to listen to often, let alone treat it as some kind of valuable sound document. I recently heard an excerpt from a Mozart piano sonata played by one of the well-known stars of today, well-played and superbly recorded, as one would expect: but he already had a couple of ‘original’ touches of rubato and rhythmic quirks in the first few bars, which might go down well in a live performance, but it is unlikely you would wish to hear it in a recording more than, perhaps, twice. My ideal of interpretation in a recording – and, indeed, it is the same in a live concert – is to offer no interpretation, to simply disappear (or dissolve) as performer into the work, so that it sounds without interpretative intervention from me. (Richter often conveys this illusion in, say, Skryabin or Schumann, that he’s just a mediator.) But it is an illusion, of course, because the moment I say “I offer no interpretation”, someone else will come and say the same, and yet their playing will differ, even, in general conception, from mine. But one can certainly try for a performance which, other than well-played, offers a reading that is natural, revealing and rewarding without any thought of being ‘different’. I think that young performers, in particular, should think about just how much they can ‘do’ in a work, while still playing the piece and only what belongs in that piece, and when it is that they are trespassing and ‘putting in’ something of their own which is unnecessary. Their task is daunting: so many gifted players trying to make an impression in Beethoven, Chopin, Liszt, Rachmaninov, etc. As I write these lines, I am listening to yet another ‘star’ (one of the biggest) play a Mozart sonata with many dynamic and rhythmic quirks that tell me his contact with Mozart’s world is only occasional and that he is worlds apart in style, manner, execution and taste from what I would consider to be a valid Mozart performance.